Once upon a time there was a brother and sister. They loved? each other so much. But as luck would have it their mother died when they were young. Their father married again and their step mother was a cruel witch. She tortured them so much. She made them do all the house hold work but gave them nothing to eat. She gave them just old bread crumbs and half the days they went hungry. Even the dogs? got better food ? than them. One day they decided to leave the house. 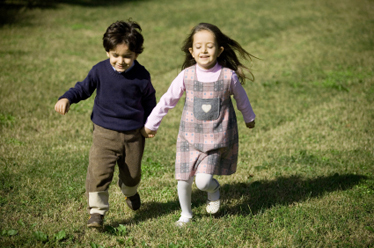 They walked along many Meadows and fields enjoying the beauty of the world. Finally they became tired and hungry. It started to rain ? as well. On searching for a shelter they came across a hollow in a ?. They entered the hollow and embracing each other they slept. When they woke up the sun ? was shining bright. They stepped out of the hollow and now they were more hungry and thirsty. They went in search of food and water?. Their wicked witch step mother had seen them go. She enchanted all the objects on the way. When they two were searching for water, they heard the rustle of water. They ran in the direction of the sound and found a stream with gleaming clear water. The brother bent to drink water when a voice warned him “Don’t drink this water if you drink you will turn into a tiger?”. On hearing this the sister started crying and told her brother not to drink because if he drinks he will become a tiger and devour her. The brother assured her that he won’t drink that water and they went elsewhere in search of water. Again they came across a stream. This time when the brother tried to drink again a voice told, “Don’t drink this water if you drink you will become a wolf?”. Again the sister begged him not to drink and the brother refrained from drinking and went in search of water elsewhere. The brother’s thirst became so intense. So he told his sister when they came across the next stream whatever may be he is going to drink. Immediately they came across a stream and the water was clear as Crystal?. The brother ran to drink. Again a voice told, “Don’t drink this water if you drink you will become a stag”. Even before the sister could speak the brother started drinking the water and soon as the water touched his mouth he became a handsome golden stag. The girl and the stag ?wept so much, but there was nothing much they could do. 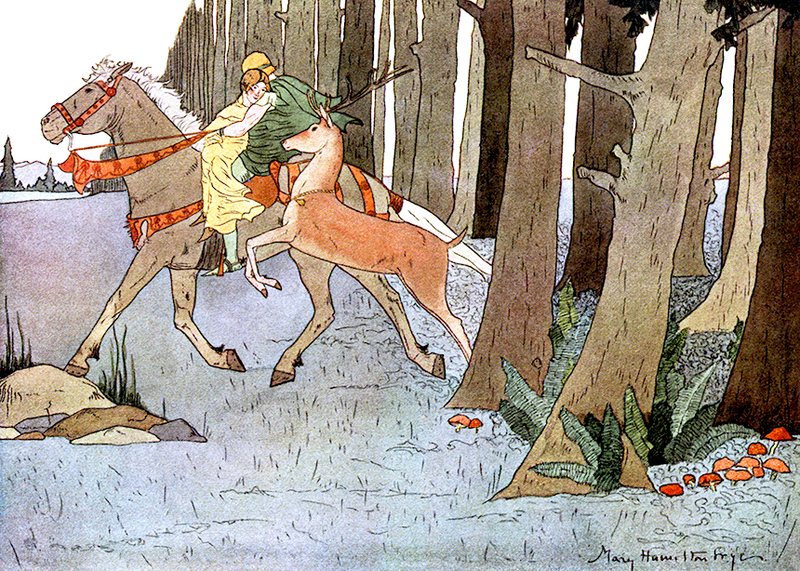 The girl tied her golden scarf around the stag’s neck and the stag followed her. Then both of them went deep into the forest. There they found a deserted hut. For them that hut was looking as a palace. They decided to stay there for ever. The girl cleared the hut. She got some soft grass and made a bed and she and the stag ? slept on it. The girl ? rested her head on the stag. 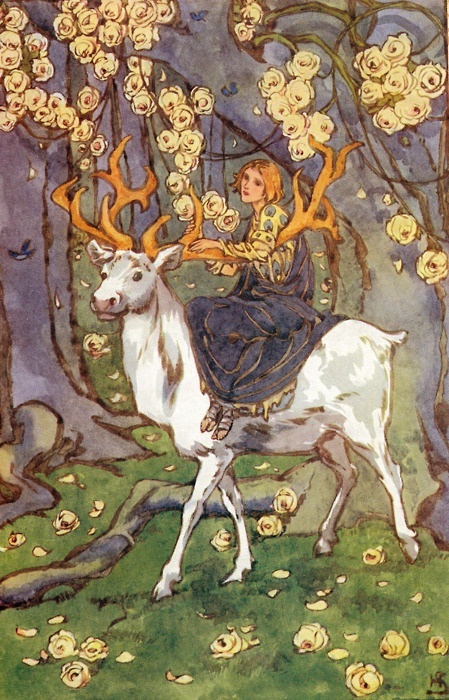 Everyday morning she and the stag would go into the forest. The stag ? fed on the lush green grasses ?and drank from the stream ?. The girl ? ate nuts and berries and fruits ?. 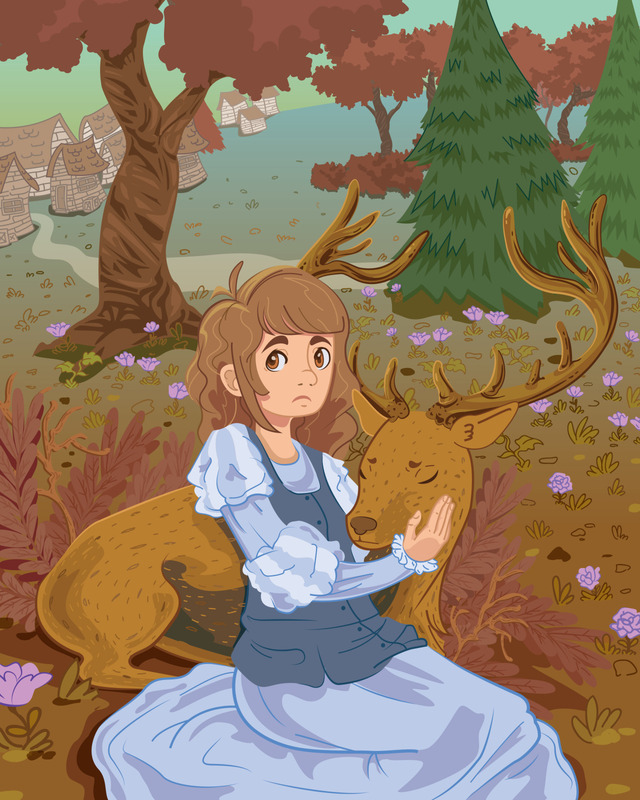 Like this they were living happily and the girl grew into a beautiful damsel and the stag ? a huge handsome one. One day the prince ? of the country came with his courtiers for hunting ?. The sound of the horse ? hooves stimulated the stag ? to go and see what was happening. But the sister cried ? that she could not let him go because if something befells him she will be left alone in the forest ?. But the stag ? insisted. So the sister told that she would allow him only if he promised to return back in the evening. Also she told she would lock the door till he comes and would open the door only if he tapped the door and told “Dear sister open the door for me” The brother promised her and she allowed him to go. The stag? reached the place where the hunting party was. Since he was a big handsome stag ? the commanders spotted him immediately and they started chasing him. The stag ran as Swift as the wind?. In the evening he came to the hut and tapped the door and said “Dear sister open the door”. Immediately the sister opened the door and the stag went in. After 15 days the prince again came for another hunting expedition. The stag ? again went there but this time when they spotted him although he ran fast they managed to hit the stag’s leg limping though he managed to reach the hut and called to his sister “Dear sister open the door” and the door opened and the stag ? went in. This was watched by one of the commanders of the prince. He was astonished to see a stag ? talk. He immediately told the prince all that he saw. In the hut the girl got shocked seeing the stag’s wound. She cleaned the blood and applied some healing herbs on the wound. Next day the prince arranged for another hunting expedition but this time he told his men not to shoot the stag but to catch it alive. In the hut on hearing the horse ? hooves again the stag ? wanted to go. But the sister was reluctant. The stag ? begged his sister then she allowed him to go. On seeing the stag ? the prince’s men started chasing it. The prince and the commander who had seen the hut ran to the hut even before the stag ? could reach there. The prince tapped the door and told ‘Dear sister open the door’. Thinking it was her brother the girl opened the door. Seeing a handsome lad standing in front of her at first she became scared but his soft looks gave her courage and she asked him who he was. The prince told about himself and said to her that he had never seen such a beautiful girl and asked her to come with him to his palace and marry him. The girl told that she would agree only if the prince agreed to allow the stag ? to live with her forever. The prince agreed to that and he took her and the stag ? to his kingdom. His parents were also happy to see the beautiful girl and arranged for the marriage immediately. The marriage ? was celebrated with pomp and show. Soon the princess? gave birth to a baby? boy. The news of the girl becoming the princess of the kingdom reached the ears ? of the witch ?step mother. She wanted to put her ugly daughter in the place of the princess ?. So she and her daughter took the form of a nurse ⛄ and approached the Queen ? for work. The Queen ? mother appointed them thinking they will take good care of her grandson ? and the princess ?. No sooner they went into the chamber of the princess ? they caste a spell on the princess ? and locked her in the bathroom. But the princess ? escaped from the bathroom. The witch ? asked her daughter to wear the dress of the princess ? and lie down in her bed. She then send news to the prince that his wife was sick and she will not be able to meet her or the baby ? for a month. The prince ordered death sentence for the witch ? mother and her daughter. The daughter was made to be devoured by a tiger ? and the witch ? mother to be burnt? alive. As soon as the witch ? mother was burnt ? the stag ? regained it’s original form and became a handsome lad. The prince asked him to live with them and they all lived happily ever after ?‍❤‍?.